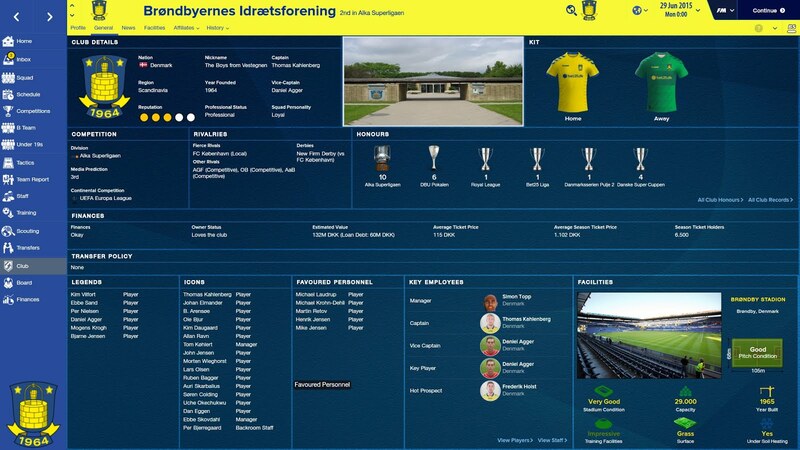 Welcome to the Brøndby IF club guide post for Football Manager 2016. Brøndby IF might not ring a bell for many football fans from Europe, outside of Scandinavia espicially but it is maybe one of the most important clubs for Danish football. The glory days from the 1990's and the early 2000's are over and the have come into trouble in the last decade and even the official Football manager Facebook page mentioned them, as a part of the "oscar gate", which was about the chairman writing bad things about players and the staff on a fan forum with an undercover name. Brøndbyernes Idræstforening was founded on the 3rd of December 1964. It was a fusion between Brøndbyøster Idrætsforening and Brøndbyvester Idrætsforening. The municipality wanted to fusion all the athletic associations from town into one and that was the birth of Brøndby IF. They were the first Danish football club to become a full time football club in 1987. Throughout the years Brøndby IF have had many excellent players comming from the youth ranks and going all the way to the first team. The most famous player to ever have played for Brøndby must be Michael Laudrup and the Laudrup family in general, as his father, Finn, aided the club in their early days to become a powerforce in Danish football and without him, Brøndby might not have been the same. Brian Laudrup has also played for the club as well as Daniel Agger is still an active player and plays for Brøndby now. Peter Schmeichel also played for the club before moving to Manchester United. The club enjoyed their most succesfull spell in the 1990's as they won many domestical titles and also made a lot of great results on the road. In 1991 Brøndby was only a few minutes away from going trough to the UEFA Cup final but they were knocked out by Roma. The best continental result for a Danish club ever. The club was close to going bankrupty in 2013 as the liquidity was running low but a huge issue of shares saved the club. Last season Brøndby finished as third place in the Danish Superliga. The season was full of inconsistent performances but in the end they managed to finish third anyways. It meant that the club fulfilled the objective of playing in Europe. In Football Manager, however, you will be meet with the same objectives. The board think that you should compete to the title but they will be satisfied if you manage to get an European ticket for the next season. As a manager for the club you should be able to push for the title in the first or second season at least. You will be given an okay budget by the board. About 600k pounds should be enough to get some good players and you will of course be given more, if you choose to sell any or set your objectives high. Frederik Rønnow - Great keeper for this level. Should be your number 1 for quite a long time. Can develop a lot too, as he is only 22 at the start. Mads Toppel - Good back-up for Rønnow, could play some cup games against lower rated sides but only has a two-year contract, so you might want to find a new back-up keeper in the near future. No potential signings needed for this position and you have Viktor Anker who has the potential to be as good as Rønnow, so this might be the strongest position for the Club. Riza Durmisi - First choice left back and for a long time. This guy has some really good physical and offensive stats but he may lack a bit defensive. You should consider playing him as a wing back. Has huge potential too and is home grown. Patrick Da Silva - Tough luck for this guy. He has both Juelsgård and Durmisi in front of him so you should maybe consider selling him or loan him out for a season. Jesper Juelsgård - Actually rated by your coaches as the best left back. Rotating between him and Durmisi might be an option. Can play CB if needed. Johan Larsson - Good player for the league. Should start the most games but keep Holst in mind as a back up. Frederik Holst - Listed as "hot prospect" on the information page. Can play many positions, both in midfield and defense. Should be back up for Larsson. Daniel Agger - Too good to play in the Superliga. By far the best player in the squad but as some Liverpool fans might remember, this guy is very injury prone. Actually, he is injured for almost two months when starting the game. You should try and extend his contract though. Martin Albrechtsen - Second best central defender in the squad but only considered good enough for the Bet25 Liga (second tier). Actually has some decent stats but there are better players out there and he is 35 so you should not extend his contract. Malthe Johansen - Was on loan at Porto B last season but has not established himself as a upcoming talent for Brøndby. Not good enough right now but has some potential in the long run. It can be a good idea to give him a new contract. You should really try and get at least one or maybe two new central defenders. Otherwise it will be hard for you to challenge for the title, also if Agger gets injured. Nicklas Halse and Mads Andersen have some potential but they are not ready for Superliga yet. Mads Fenger from Randers is a potential transfer target. Andreas Maxø from FC Nordsjælland should also be considered. His contract runs out at the end of the season so you could get him quite cheap. Rodolph Austin - Hardhitter on the field. Great defensive miedfilder but very aggressive. Will fit very well in the ball winning midfield role. Martin Ørnskov - All around player. Not the best player so you might want to skip him but you can only get about 100-200k for him so it might not be worth. Can play many positions though. Lebogang Phiri - Hard working midfielder. He can be your star if you choose to play with a box-to-box midfielder. Can grow a little bit more but he has a good level already. Christian Nørgaard - Has huge potential and he can become a really good player if he is played in the right position and has the right tutor. Best in a playmaker role. Magnus Eriksson - Hard to find the right position for this player. You can try him out both as a winger, central midfielder and offensive midfielder. He has recently arrived so he should get his time to adapt. Thomas Kahlenberg - The star player in the midfield. Exceptionel technical stats for this level. Will make wonders for you in a deep lying playmaker role. However he is 32 and quite injury prone, just like Agger. Nørgaard may be a long time replacement. Brøndby have a very strong midfield with a lot of different players. Holst can also play in the midfield so no signings are needed. If you should consider a signing, nonetheless, try and look after Emiliano Marcondes from FC Nordsjælland. On the youth side they have Magnus Hauser as an allright prospect but he should be trained very well. David Boysen - Technically gifted winger who should be a starter. Can play on both sides. Might lack a little bit mental. Andrew Hjulsager - Great potential for this young player, who can also play in the center attacking mid or on the central midfield. Christian Jakobsen - Not really more than a back up player. There are better players for you but at least he does not complain about game time nor gets a big salary. The Brøndby side are very weak on the wings and allthough Boysen and Hjulsager have som good stats you should look for another winger maybe. Teemu Pukki - The Finnish striker has some great stats for this level and can bang many goals in a season. Can also play as winger. Best striker on the team. Daniel Stückler - It may be best to loan out this young striker as his game time will be limited. He has okay potential. Kamil Wilczek - Arrived from Italian football in real life after only 6 months in the south. Quite average player with no real strengths or weaknesses. Can also play at center attacking midfield. Johan Elmander - The agening Swede will only play a minor role for your team. Has some mediocrore stats but wont be a game changer. Should be shipped in the summer or let him go for free at the end of the season. Brøndby have some attacking threat with both Pukki and Wilczek being good players. Also Gustaf Nilsson will arrive at the start of the second season and he has some potential. As you have read from above Brøndby's strength lie through the middle so it should be considered to play a 4-2-3-1 formation with ball control and playing the ball inside the oppositions penalty box. Playing a 4-4-2 could also be quite interestin. Especially if you get Pukki and Wilczek to work it out together. If you choose to play with one of these two formations you should consider buying a new winger and at least one central defender. Brøndby is indeed a sleeping giant in Danish football. The club has not won a title since 2008 and has not been champions since 2005. It will not be an easy job for you as a manager to led the club to glory but with a mix of great talents (Durmisi, Phiri, Hjulsager, Nørgaard) and experience (Agger, Kahlenberg) it could be a fun challenge. The club has a great stadium with almost 30 000 seats. Also the youth and training facilities are some of the best in the country. At last, I wish you good luck if you should start a save game with this club. If you want to follow my career with Brøndby, click here. A club guide about the Danish club, Brøndby IF. The guide brings the reader around the club and there is a full squad report and some transfer targets aswell.